Hi everyone! Hope you're all enjoying your weekend so far. 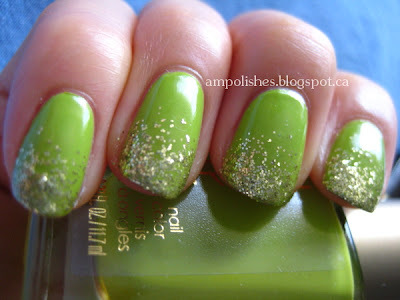 Today I have a quick post of a manicure I did a couple days ago. A couple weeks ago L'Oreal generously sent Mir and I a package of assorted nail polishes. When I saw the names of these 2 polishes I knew they needed to be used together! I decided to do a glitter gradient using New Money as a base colour and Gold Carat on top. 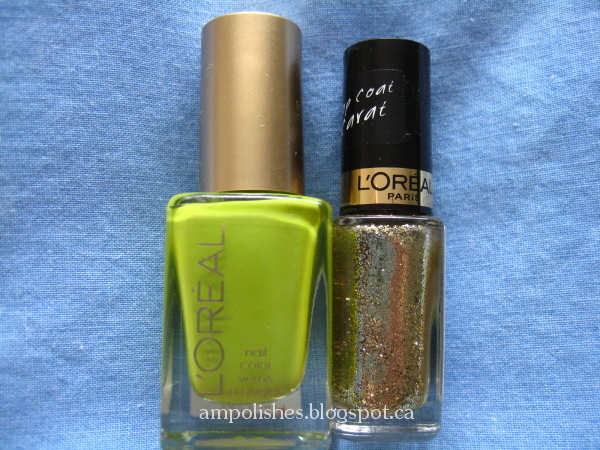 L'Oreal New Money is a chartreuse green, half way between green and yellow. I absolutely love L'Oreal's Colour Riche line, I have yet to be disappointed with the polishes they sent us to review. 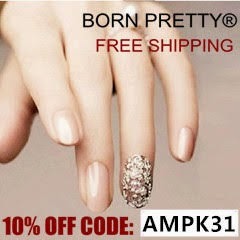 Every polish applied like a dream and could certainly pass off as one coaters. Click to read and see more! Gold Carat is part of L'Oreal's new line of top coats which became available in store this month. Gold Carat is a gold glitter top coat, for the gradient I used a sponge to dab on the glitter. I found that applying the polish directly onto the sponge worked much more effectively. The sponge really absorbs the polish so I found that I had to apply Gold Carat multiple times onto the sponge to create the look I was aiming for. There you have it folks, if you guys haven't tired a glitter gradient before don't be intimidated by it. This look was so super easy to create and pretty much fool proof. It does require a little bit of clean up afterwards because things can get a little messy with the sponge.